A new citizens group has recently been formed in Japan by people who oppose genetically modified food plus moms who participated in the March, 2017 events with Zen Honeycutt of Moms Across America. The group is called “Moms’ Project to Change our Food in Japan!” We are Japanese mothers who want to give safe food to their children, wishing to reduce the amount of pesticides and artificial additives in their food, as well as avoid GMOs. 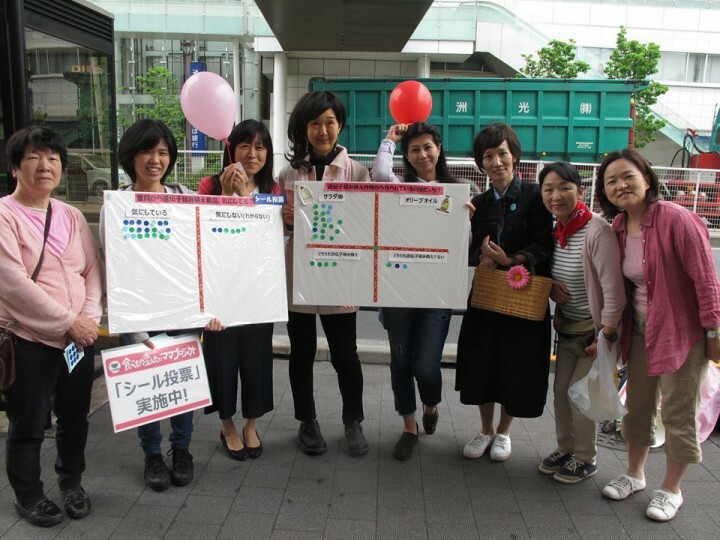 During the first event in the Tokyo suburb of Futakotamagawa we used a visual questionnaire to let people place stickers based on their opinions and knowledge about GMO food. We held the event outside the busy Futakotamagawa train station where many families with baby strollers are passing by. All of us had decided to wear something pink and we also brought pink balloons. For about one hour, 27 people participated by placing stickers on our board with questions. 21 people indicated that they worry about genetically modified food and 6 people indicated that they are not worrying or do not understand the issue. We also gave participants an opportunity to indicate which foods they think may be GMOs. 19 people correctly indicated that salad oil may be GMO and nobody indicated olive oil (there is indeed no GMO olive oil on the market). Only one person indicated that they did not know the answer. We thought it was encouraging that so many people share our concerns and also that so many knew the right answers regarding GMOs and are aware of the issue. It was also a good opportunity to explain that many GMO foods are not labelled, and that we want to change the labelling legislation so that people who wish to do so can avoid GMOs. “It’s a problem that we can’t choose” as one participant expressed it. This was a brief event and we want to thank everyone who participated in making it a success. We will continue to hold similar events all over Japan in the near future.